“Uncle Rod”, as he is affectionately known to his clients, became a student of all things dog at a very young age. The mystery of inter-species relationships and how animals communicate fascinated him as a young man and remains the guiding passion of his career and the services he provides his clients. Rod specializes in helping families with “problematic” or “aggressive” dogs and his driving motivation is to share his extensive knowledge and experience with you to improve the life you share with the dogs you love. Rod’s professional training and education has focused on how dogs behave and how, we as humans, can work with dogs in a way they understand. 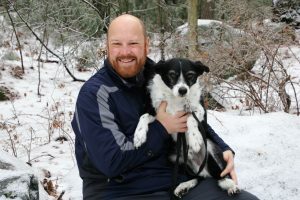 Through his work and by dispelling the many myths and assumptions surrounding dogs and their behavior Rod has dedicated his life to helping you sift through the overwhelming mountain of often conflicting information available. As an advocate for a humane and positive approach to dog training and communication, Uncle Rod will show you how your family life will benefit from a happy, healthy dog who you can understand and effectively communicate with. Rod’s professional experience spans nearly a decade as a Certified Trainer and he has over 30 years experience training and owning dogs. You can find “Uncle Rod” in Lynn, MA with Duke, his amazing and trusty beloved canine of 9 years. The DogSmith of Boston North offers dog training, dog behavior consulting and dog bite safety education in the Boston area including Lynn, Saugus, Swampscott, Nahant, Lynnfield, Peabody, Salem, Revere, Woburn, Burlington, North Reading, Reading, Wakefield, Wilmington, Winchester, Beverly, Danvers, Essex, Gloucester, Ipswich, Manchester by the Sea, Marblehead, Middleton, Rockport, Hamilton, Topsfield, Wenham, East Boston, Medford, North Cambridge, Cambridge, East Cambridge, Somerville, Malden, Everett, Chelsea, Winthrop, Melrose, Stoneham, Waltham, Arlington and Belmont.